For the Haunted Halloween event with Jessica at Confessions of a Bookaholic, I was asked to guest blog a scary story. So this is what I picked. Enjoy! My overactive imagination creates interesting drama in my life, especially when I sleep. For instance, I still can’t swim alone, even in a pool, thanks to Jaws. And, for a long time, I couldn’t go potty without looking down into the bowl to check for critters. So, I avoid horror and scary things at all costs. But my imagination is very helpful with my creative writing, so I can’t go wrong there. I’ve always been an active dreamer, talking nightly in my sleep. Many times, it’s just an endless puzzle I’m trying to solve, salt and peppered with visions of the daily events that makes so much sense when I’m half awake, but slips away once I become lucid. So, when my husband and I were first married, I seemed to be more active than usual. I’d freak him out, frequently talking and/or getting out of bed, scared or worried about something or another. He’d just consol me (probably to get me to be quiet) and I’d go back to sleep. But one night, I woke up and saw what I thought to be an alien, flutter from the curtains, fly under our sheets and possess the love of my life before my eyes. At my gasp he tried to consol me, reaching out, but I screamed bloody murder and fought his arms in absolute panic, afraid the creature inside was coming to get me next. Once my mind became clearer and dear hubby was able to grab me and talk me down from my hysteria, I burst into tears, thankful he was still himself and not some horrible creature I’d dreamt him to be. I’m happy to say, after nine years of marriage, he sleeps through most of my night activities except when I see spiders. http://www.onceuponatwilight.com/2010/10/halloween-spooktacular-giveaway-part-5.html?spref=twI had a spookacular guest post on Once upon a Twilight and I thought I'd post it here as well. 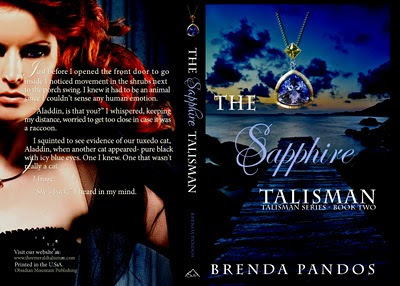 I’m feverishly finishing up edits for The Sapphire Talisman early Friday morning before the kids wake up when there’s a knock at the door. I stop and listen. I hadn’t expected anyone. Who the heck would be out this early? My heart hammers for a moment. Maybe it’s the postman? I jump up from the couch in excitement. My swag must be here! Yippee! Expecting to see the postman, I throw open the door (after I put on a robe over my jammies, of course) and smile. But it’s not the postman. My eyes grow big as saucers, mouth thick with cotton. “Phil? What are you doing here?” I breathlessly ask. “I see you are still writing with lots of cliché’s,” he says with a chuckle. “Oh,” I blush, pulling my dingy robe tight around my body, and then glance around my living room. Toys and kids books lay scattered across the dirty floor, laundry looms on the other couch. “Here, sit down.” I move my laptop and idea journal from the couch onto the floor. Phil saunters in, hot as ever and I try not to think dirty thoughts. He is fifteen years younger than me and I’m a happily married woman. Oy vey! “Wish you could read my emotions, don’t you?” He says, coy as ever. We sit and look at each other for a moment. I don’t know why I’m nervous. Maybe it’s because he is so adorable in person, I can’t help but gawk. And, I’ve not showered yet. “So, what brings you here?” I finally ask, running my tongue over my teeth checking to see if I’d brushed (I did). “I kind of want to see what you’ve got written in those pages over there,” he cranes his neck to look at my screen, which I push out of his view. He licks his lips. “I’ve been reading all the book blogger reviews, and a lot of your readers are kinda wanting me to come back.” He gives his leg weakening grin. I turn away and compose myself, trying my best to keep a poker face. Phil’s face lights up and he raises his right eyebrow. He continues to smile. I try not to swoon. I smile and admire how observant he is. Never far away from my own reality, I suppose. “Fine,” I say and motion for him to come closer. “Brat,” he said with pouty lips, before checking out the window. The morning light just starts to filter into the sky. We both stand up, just as Aaron starts to say “Mommy” from his bedroom. “Come back in a few weeks, and I’ll give you an ARC, okay?” I interject quickly, realizing our time is limited to seconds now. And with a brush against my cheek, the door opens and he’s gone. Only then do I smile wickedly.